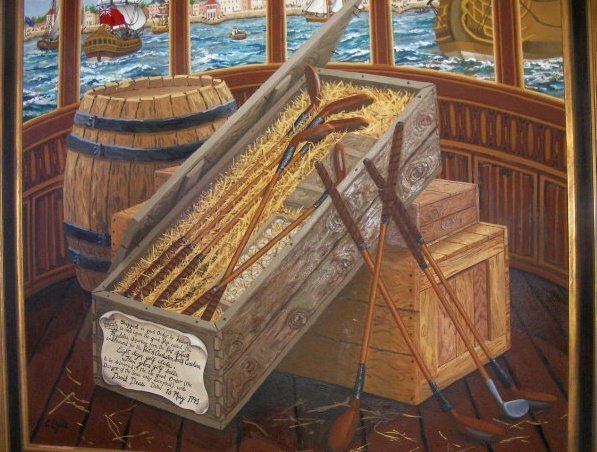 Carrol Ezell’s painting of the historical arrival of the shipment of golf clubs and balls from Leith, Scotland, to the colonies by way of David Deas of Charleston, SC, in 1743, shows the opened crates on board with a harbor view. The inscription includes details of the historical event: David Deas the recipient, May [10th/16th/18th(? )], 1743, 96 clubs and 432 balls. My question is why is the crate opened? From the windowed cabin, it would seem that these are in the captain’s quarters at the stern. So perhaps, a Leith or Fife-man himself, he was grooving his swing during the long voyage across the Atlantic, perhaps even sending a few rounded wooden balls out into the sea off the main deck!